Mary E. Hunt, MTS ’74, has no time for hand-wringing. She’s deeply concerned about the future of the country and the world, particularly since last November’s election. She speaks with a sense of urgency about the plight of immigrants, refugees, people of color, women, dependent children, and the natural environment. But Hunt has come too far—and is too busy working for justice—to indulge in despair. Wherever they start, activists who work through the principles of feminist liberation theology will build on a foundation established in large part by Hunt and her colleagues. As the co-founder of the D.C.-area nonprofit Women’s Alliance for Theology, Ethics, and Ritual (WATER), Hunt and her partner Diann Neu have spent nearly 35 years building an educational/spiritual space that brings together feminism, faith, and justice. For this work—and a lifetime spent fighting for social change—Hunt’s fellow HDS alumni will recognize her at the School’s bicentennial celebration this April as a Peter J. Gomes STB ’68 Memorial Honoree. The daughter of an Irish Catholic family, Hunt describes her upbringing in Syracuse, New York, during the postwar economic boom as “quite comfortable.” A parochial school education, however, acquainted her with “white privilege” when she was still young. Her high school experience included service at an inner city program and a Native American reservation. She saw grinding poverty first-hand during two summer stints with the Christian Appalachian Project in Kentucky. Hunt continued on to college at another Catholic institution, Marquette University. There she majored both in theology and philosophy but still graduated in only three years. Nominated for a Danforth Fellowship, she applied to HDS, earned admission, and enrolled in the fall of 1972, part of a cohort of women who for the first time made up a substantial portion of the HDS student body. Hunt found herself with some remarkable classmates. Two scholars then on the HDS faculty had an outsized influence on Hunt. The Catholic theologian Rosemary Radford Reuther introduced questions of gender and sexuality into the School’s curriculum. The Uruguayan Jesuit priest and liberation theologian Juan Luis Segundo did the same with economics and international relations. From HDS, Hunt enrolled in the doctoral program at the Graduate Theological Union in conjunction with the University of California, Berkeley. In the process, she also obtained a master of divinity from the Jesuit School of Theology Berkeley, completing the curriculum necessary for ordination as a Catholic priest. It was there Hunt decided that having “a professional and personal life that was seen as being full of integrity” meant being an “out” lesbian. It was a costly choice in the 1970s, particularly for an aspiring Catholic academic, but one that Hunt says she felt morally obligated to make. Following her doctoral program, Hunt traveled to Argentina with Frontier Internship in Mission, a program founded by the Presbyterian Church and designed to develop international ecumenical leaders. After two years there, Hunt lectured in Europe, then returned to the United States. 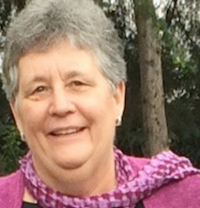 Her partner Diann Neu, then a nun, lived with some members of NETWORK, the Catholic social justice lobby based in Washington, D.C. One person suggested that Hunt start something similar, specifically an alliance for women in theology. So, she typed up a two-page proposal and shopped it around to colleagues who urged her and Neu to launch the new organization. The two decided to move forward but needed a name for the project. Over the course of 34 years, Hunt and Neu have built WATER into a vibrant organization that goes far beyond conventional approaches to religion to provide a wide array of intellectual, political, and spiritual resources to those working for social change. Neu, who holds master’s degrees in divinity and social work as well as a doctorate in ministry, works at the intersection of psychology and spirituality, serving those whose concerns neither ministry nor therapy can fully address. Hunt writes, teaches all over the world, and organizes WATER’s connections with a range of coalitions that include the Women-Church Convergence made up of progressive groups like Catholics for Choice and Dignity. WATER is also a member of the National Religious Leadership Roundtable, a coalition of LGBTIQ faith groups. On any given day Hunt could be in Washington, D.C. running a phone-based meditation group; in Mexico City lecturing to feminists as part of WATER’s Mujeres Cruzando Mundos (Women Crossing Worlds) initiative; or in Brazil doing theological work with Catholics for Choice. Because WATER runs with a very lean administrative structure—the group has only three full-time staff with at least as many summer interns—Hunt says it can remain nimble and allow its agenda to reflect changing needs of the world. Hunt says WATER’s agility is more important than ever in the wake of last November’s elections. (“I tell people, if your agenda hasn’t changed, you’re not paying attention.”) She’s encouraged by the way that people have mobilized since then but says that lasting, positive change demands more than demonstrations and disobedience. Looking forward, Hunt says that her perspective is increasingly influenced by the fact that she and Neu have a 16-year-old daughter. She thinks a lot about how the world is for young people—and about the future they will inherit.